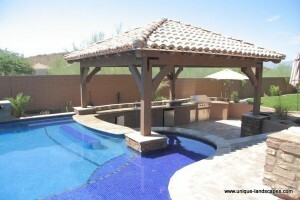 Swim-up bars make it easy and fun to entertain friends and family, while soaking up the Arizona sun at the same time. Swim-up bars are typically found at tropical resorts but have recently become popular to have in residential backyards. A swim-up bar can be a great place to relax and lounge in your own backyard while enjoying a frozen drink or barbecue dinner sitting in your pool. One of the major benefits that many people might not be aware of is that swim-up bar can save space, since it connects the two features of an outdoor kitchen/cook area and seating. Since seating is placed in the pool itself, it eliminates the need to mark off space for additional patio furniture or circulation between the two areas. 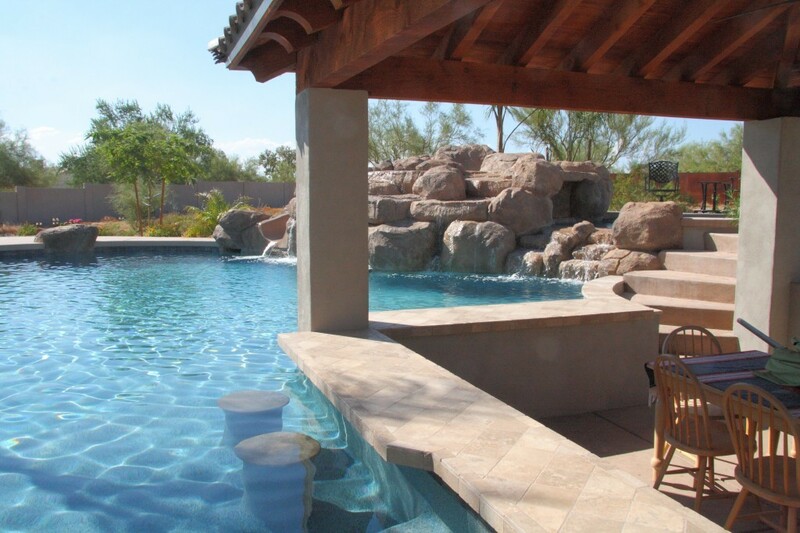 Our swim up bars and pool bars are truly unique and custom designed for each of our projects. Our professional tile settings and outdoor kitchen builders are standing by to develop and build some of our kitchen quality counter tops, tables and bars for the bar area of our projects. The sunken area requires retaining walls, and masonry work – who better to do this than a landscape contractor & masonry company (UNIQUE!). Most of our swim up bars have some of our barbecues and outdoor kitchens – which are designed and constructed along with the swimming pool. When installing a swim-up bar, the height of the seat and counter are crucial. Typically, swim-up bars are placed in shallow areas with 30 to 42 inches of water.The swim-up bar counter should be 6 inches above the pool’s coping and high enough to provide sufficient knee room. The seat should be designed and built at a height that is comfortable for sitting and allows the person to remain partially submerged in the water. A swim-up bar must be accessible from within the water and from the cooking area on the other side of the counter. This way people out of the pool can provide food and drinks, as well as socialize with those sitting at the swim-up bar. The makes it possible for a regular chair to be pulled up to the dry side of the swim-up bar. 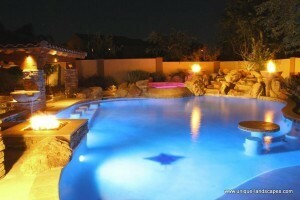 Bring home resort style living to your own backyard with this amazing addition to your pool.